Many times Lake Charles Real Estate transactions will have contingencies attached to the offer. Most of the time a repeat home buyer will need to sell their current home in order to purchase another, so the Contingency Addendum will apply to the purchase contract. It is possible to buy a home and sell your home at the same time and the Realtors and loan officer involved in the client’s home sell and/or new purchase try to coordinate the closing dates. All that is usually needed to remove the contingency is a copy of the HUD settlement statement from the previous home sale. A Seller and Buyer can close on the sale of their home in the morning and close on their sale of the new home soon after, within the same day. YES it can be done if all the pieces come together! Should you get an offer on your home before you try to find a new place to buy? Or should you find the home you want before putting yours on the market? Do you have a place to go should your home sell before you close on your new home purchase? Before you begin, think through the scenarios and have a well thought-out plan, a good Realtor on your team and have all of your ducks in a row in advance. 1. Know your financial situation. This is a no brainer. You need to know not only what you can afford to buy, but also, what your house is worth before you even get started. Talk to your real estate agent and consult a mortgage banker or broker for pre loan approval and a market analysis of your Lake Charles home. 2. Start packing. Start boxing up stuff you don’t need easy access to. Get rid of all the things you won’t need until you’ve moved into your new home. This will help make your home show better and starting the packing process now will make it that much easier to move later. You may need to rent a storage unit temporarily for your stuff. 3. Do whatever quick fixes you need to do to sell your home. Do you have a toilet that constantly runs? Is your kitchen right out of the 1950s? If so, get busy fixing those things that could cause your home to sit on the market longer than necessary or affect your home’s value. 4. 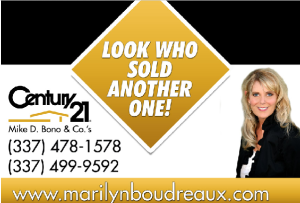 Start home shopping and reviewing the Lake Charles real estate market. Start going to open houses and seeing what’s out there. 5. When you’re ready, list it. List your home as soon as possible and consider the busy real estate season of summer months when your home will attract more buyers. What are your options and what can you expect in the buy/sell process; You might find a home you love before you’ve got a firm offer on your house. In that situation, you could make the seller an offer with a contingency that your offer is subject to the sale of your home. On the other hand, let’s say you’re the seller and someone has made a solid offer on your home. Great. But you haven’t found your next home yet. Here, you might ask the buyer to let you stay in your home for a month or more as a renter, while you continue your house search.